Extensive research has shown that ultra-processed foods are linked to a higher cancer risk and are foods that usually harbor lists of ingredients with words people cannot normally pronounce or recognize without doing looking up the origin on the Internet. Needless to say, they do not contain healthy qualities and are not recommended for a proper daily regimen, yet they are also difficult to oppose when we are exposed to their foods on a daily basis. For example, how easy is it to say “No” to a fresh box of pastries from the local bakery or a milkshake on a hot day? It’s not very simple, as we are tempted by these types of food almost everywhere we go. Examples of such foods may be disguised with labels that claim they’re made just as they would be at home, such as canned soups that are filled with artificial flavoring and other such chemicals. Ultra-processed foods tend to have higher amounts of calories, sodium and sugar compared to processed food in general. Research suggests that people who primarily eat food high in ultra-processed ingredients tend to be more obese and overweight, as well as more likely to be diagnosed with heath problems and/or diabetes. 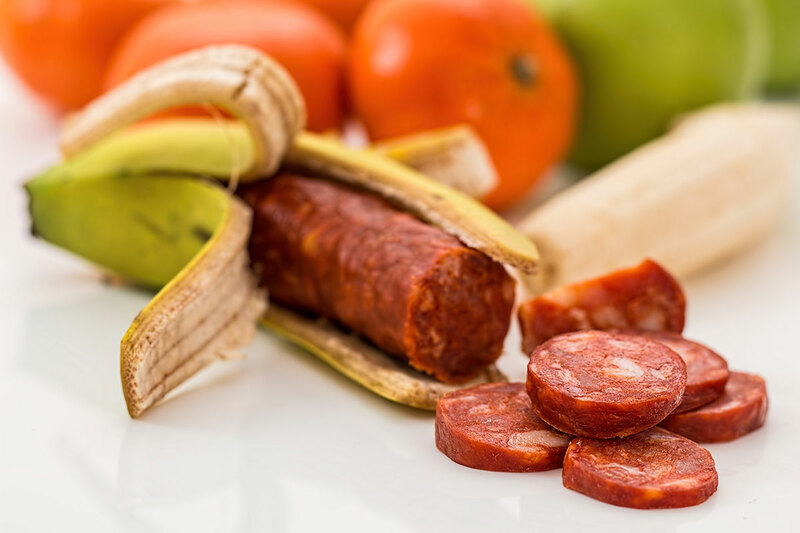 One example of ultra-processed foods includes processed meat, such as sausages, that have shown an increased risk of colorectal cancer according to the NutriNet-Sante cohort study; in this research based on a population in France of approximately 105,000 adults, their day-long regimen reports showed a wide range of more than three thousand types of food that were categorized by their processing through a system called NOVA (emphasized by World Nutrition that it is a name, not an acronym). The research brought a conclusion to scientists that a 10% increase in the amount of ultra-processed foods in a population’s diet brought a significant increase of more than 10% in risks for developing cancer. According to the study, ultra-processed ingredients found in fats, sauces, sugar drinks and products lead to a higher risk of overall cancer, yet ultra-processed sugary products were associated with a higher chance of developing breast cancer. Another pattern found in individuals with a diet high in ultra-processed foods was a tendency to smoke more tobacco and exercise less than their peers; however, the researchers observed that the unwavering similarity remained with a higher risk of cancer. Tom Sanders, scientific governor of the British Nutrition Foundation and the emeritus professor at King’s College London, brought another perspective to the table by stating that the choice of food people make to eat may not be a direct correlation to the risk of cancer. He elaborates that “What people eat is an expression of their lifestyle in general…[s]o it is necessary to rule out what are called cofounding [sp.] factors.” Confounding factors are known as third variables that researchers have not controlled or eliminated, which give a questionable finding to the entirety of the experiment. Marji McCullough, strategic director of nutritional epidemiology at the American Cancer Society, advises people take caution before becoming overly-conscious about the types of food they are eating. McCullough encourages people not to think “’If I eat this cracker, I’m going to get cancer.’” She explains that this particular study focused on the purpose of highlighting dietary patterns with ultra-processed foods as opposed to emphasizing one specific ingredient. She shifts gears with the explanation to show the perspective from the other side of the argument, showing that people who eat processed foods more than likely are not eating as much healthy food, which may be the reason to a higher chance of developing cancer. It would also support the claim nutritionists make when they recommend people to maintain a diet with whole grains, fruits and vegetables. Study co-author Mathilde Touvier supports this study as an observation due to the fact that scientists do not know the exact root behind the increased risk of cancer. Although studies have taken place in animals that suggest certain additives as being carcinogenic, Touvier says “but that would need to be seen if they are also carcinogenic in the human population.” Although she support the idea of not being overly-cautious about this research, it has been found that 60% of the calories in an average American’s diet come from ultra-processed foods. A study in 2017 found that they comprise 50% of the Canadian regime, and more than 50% of the UK diet. Researchers behind this study recommended a balanced diet with a diverse number of options to incorporate whole foods and eliminate processed foods as much as possible.